Mobile-ready software component marketplace, Verious has launched a new local search mobile component any mobile developer can use in their own apps. The Local search component would be a perfect addition to city guide applications, restaurant review apps, local deals apps, real-estate apps, and handles all of the real-time calls, back-end content parsing, data presentation and caching necessary to bring the store locator functionality into a native mobile app. The component is integrated with the CityGrid Places API, providing access to 15M local businesses and over 1M local advertisers in the US. The local mobile search component from Verious provides a quick, yet powerful way for developers to deploy local search using CityGrid places into their mobile apps. The component is one of thousands of modules, mobile developers can take advantage of on the Verious platform. Of course CityGrid Places, Offers, Reviews andAdvertising are first in that stack, but I want to identify other APIs, tools and platforms that can also assist you in quickly building your mobile app. As I add items to this stack. I will showcase them one by one here on the blog. The next one on my list is Parse, which offers a pretty impressive data storage, push notifications and user management platform for your mobile backend. Data Storage – Providing native SDKs for iPhone and Android ORM data storage platform, allowing objects to be stored and retrieved as needed. Push Notifications – A standardized push notification platform across iPhone and Android, overcoming the headaches of each individual platforms notification system. User Management – Nobody likes having to rewrite your own user management system, so parse provides one that securely allows you to sign up, login and manage users across multiple devices. 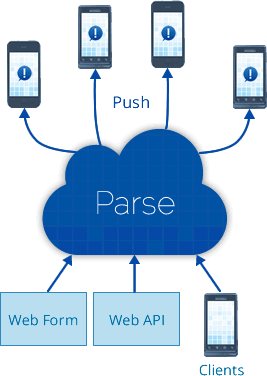 At first glance I thought Parse was just another back-end for iOS or Android mobile applications, but I see they have a robust REST API, that can be used in mobile web apps as well. This means you can access the same users, data storage and take advantage of push notifications in your mobile web, or just the web version of your applications platform. You can export all of your data if you no longer want to use Parse. Native app usage is definitely growing with more smart phone usage, but bridging the worlds between multiple devices as well as on the web is critical. 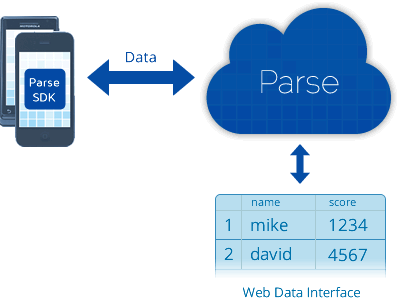 Parse making the decision to provide a REST interface to your mobile back-end is smart. Parse seems to be truly about making mobile app developers lives easier, with constant improvements coming down the pipes, like syncing, realtime push, and analytics soon — all without having to develop, maintain, and deploy complicated server code. I’m adding Parse to the CityGrid Local, Mobile, Social Stack and will be weaving more of their services into what we offer here in the CityGrid Developer Center as well as our hackathon tools.